It made perfect sense back then. You travel a long distance to Jerusalem for Passover – a “pilgrimage,” we call it. Would you really want to lug everything with you, especially those blasted animals for your offering to God? Better to pay as you go, right? Pick up what you need at the last minute. So what if the price of convenience is rather steep. So what if it’s become a racket, with everyone on the take. So what if those who have little are fleeced for their last coin, the exchange rate adjusted to benefit the Temple. Just so long as the pleasing odor of the burnt offerings rises heavenward. That’s the whole purpose, isn’t it? Anything else would be … well, foolish. Am I right? Here we are on the third Sunday of Lent, sisters and brothers. Our remembrance of Jesus entering Jerusalem on a donkey, acclaimed with “hosanna’s” and palm branches is still three weeks away. Just so you know, that is when Matthew, Mark, and Luke fit this story of Jesus cleansing the Temple in their gospel order, my friends – in the last week Jesus spent on earth. On the other hand, John (not to be confused with the baptizer) situates it early on, during a previous Passover, toward the beginning of the ministry of Jesus. In the preceding verses, our Lord has called disciples and changed water into wine at a wedding celebration. From Cana of Galilee, the scene then shifts to Jerusalem. It’s different, but there is a purpose to John’s organization of the story. Early on, you see, John reveals Jesus as challenging the order of things. This Word become flesh dwelling among us (1:14) does not start out as a baby in this gospel. He comes as a light that throws the world into sharp contrast. That’s why John puts this story here toward the beginning. From the start, he is defying the norms, confronting the way things are, envisioning a new way – God’s design. In the very next chapter, Jesus encounters a religious leader who may have witnessed what happened in the temple. The Pharisee Nicodemus comes by night, full of questions. Jesus responds to his questions like a midwife: “Your old way of seeing God’s way isn’t working,” he says. “You’ve got to see through fresh eyes, like a newborn in the Spirit.” We don’t witness Jesus being born at the beginning of John’s gospel because we are the ones who need to be born from above. Otherwise, how can we see even a little bit of God’s design? Many years ago, we were camping on the coast of South Carolina. The sweaty task of setting up had been completed, and it was time to explore the state park. I can still remember leaving the beaten path and walking quickly, running even, through the trees. Then, fortunately, something caught my eye and brought me to an immediate stop. There, right in front of me, was a huge spider web, with an enormous arachnid at its center at face level. Had I not seen it, I would have been wearing this creature. Now, mind you, the web was a thing of beauty, but in that moment, it made my skin crawl. 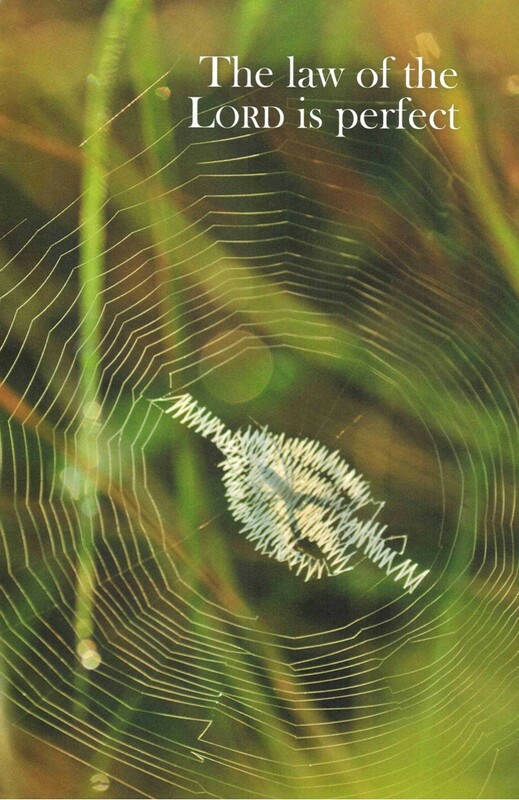 I find it interesting that the bulletin cover for this week uses a spider web to visualize God’s design, using the words of the Psalmist, “the law of the Lord is perfect” (19:7a). I know we had you do this earlier in our worship, but take another moment to look over that picture, which is also on the screen. Can you see the beauty of it? Also, tell me, in the usual way we use the word, would you say this web is “perfect?” If it were “perfect” (as we often define perfection), wouldn’t the rings of sticky silk be more uniform – like the grooves in a record? They aren’t, are they? There are numerous imperfections, in fact. And yet, seen through different eyes, there is a “perfect” beauty to it. Furthermore, it is perfect for doing what it needs to do – catching bugs. Can you see the beauty of it, even with the fierce insect in the center? Comparing this image to the Torah (the Law) is not to say that God’s design is a trap set to ensnare us like fodder for a spider’s meal. Of course, that might be how some see it. Maybe even how we, in are darker moments understand our Maker – always out to get us. Is that truth, however? Now, the law, as the apostle Paul noted, can operate in that way for us. The law of Moses, intended as it was to give shape to a people, to set a protective boundary around them, to help them to live, actually made very evident how broken they were, how far from God they had wandered, how sin deeply wove its web around and within them. According to Paul, the law apart from grace leads to death, not life. But that was not the original intent, the design. At least, not according to John’s gospel, which opens with, “In the beginning was the Word,” echoing Genesis, chapter 1. We know from the start of the Bible that God spoke the world into existence, saying - for instance - “let there be light” and it was so. And behold, it was good. A word from God created… Let me remind you that in Jewish circles, what we read earlier in worship are not called “commandments,” but rather the ten “words” of God. Torah is Word. Don’t we often call the Bible: God’s Word? According to John’s gospel, this creative, shaping, protecting, living “Word” becomes flesh and blood in Jesus. He is God’s design in human form. With that in mind, let’s revisit the story of Jesus cleansing the temple, as told by John. What we see here is not “Jesus meek and mild,” but rather the “strong, righteous man of Galilee,” to borrow from that old hymn. He is intentional. His actions are not reckless. In John’s gospel, Jesus “makes” a whip to clean out his Father’s house. He’s not in a frenzy. Yes, his disciples recalled the words of the Psalmist: “It is zeal for your house that has consumed me” (Psalm 69:9), as they later tried to make sense of what happened. But there is a purposefulness to his passion here. Jesus is not lost in an uncontrollable, almost vicious, rage. He takes the time to make the tool he uses. It’s almost like counting to ten. That is how John remembers it. Matthew, Mark, and Luke, who place this episode toward the end of their gospels, right after the events we recall on Palm Sunday, make no mention of what Jesus used to drive out the animals. They also shift the wording in a more criminal direction, with Jesus saying, “It is written, ‘My house shall be called a house of prayer’; but you are making it a den of robbers” (Matthew 21:13, Mark 11:17, Luke 19:46). Here, toward the beginning of the gospel story as told by John, the concern of Jesus is over the Temple becoming a one-stop shopping mall. I guess I’ve dated myself with that image. Malls, which once replaced main street stores, are now being replaced by online shopping. It’s a whole different world, this marketplace. The problem with making God’s house into one remains, whether we see cattle stalls, mall kiosks, or pop-up ads. Now, I know some of us grow uneasy about church fundraisers, since they may lead in the direction of making God’s house into a marketplace. And there is a degree of truth to that. What is harmful about a marketplace is how it connects us to each other and to God. We become dollar signs to one another. And we can buy our way to our Creator. The problem is that our money becomes our God – the Almighty Dollar. This tears us apart on so many levels. It destroys community. Just ask the folks in Corinth, who were deeply divided between the “haves” and the “have nots,” according to Paul. Money is power, and power corrupts. What happens in God’s house needs to focus upon what we hold in common, not what divides us. What happens in God’s house needs to draw us closer to our Maker. In truth, the system of burning animals and grains - or whatever modern-day equivalents we come up with - aren’t what connects us. These were and are a distraction, a waste. “What does the Lord require of you,” asked the prophet Micah, “but to do justice, and to love kindness, and to walk humbly with your God?” (6:8) “Let the words of my mouth and the meditation of my heart,” prayed the psalmist, “be pleasing to you, O Lord, my rock and my redeemer” (19:14). Toward the end of John’s gospel, just as in the other three, Jesus lived out the sacrifice needed to connect God’s people to one another and to their God. To be honest, it does seem a bit foolish to lift up a symbol of what appears to be a failure, an instrument of terror and death – a cross – as revealing God’s grace and glory. According to John, this is part 2 of cleansing the temple, confronting the powers that be, dismantling the old order. The cross shows us the web of God’s design. This is how much God so loved the world, giving – in the words of Jesus to Nicodemus – “his only begotten Son” to draw everyone, all of us included, home… We set aside the gold plated cross which usually sits on our worship center, and our young people have replaced it with a simple wooden cross. Take a few moments and just look at it. I will then draw this message to a close by repeating the foolish words of the apostle Paul we heard earlier.